A benchmark installation of three energy storage systems by the technology group Wärtsilä onboard an offshore construction vessel features, for the first time ever, energy and load sharing capability. The system combines a diesel-electric configuration with batteries, and is designed to deliver impressive fuel savings for the ship of as much as 50 percent, given optimal operating conditions. The installation was carried out in February 2018 onboard the North Sea Shipping AS owned ‘North Sea Giant’, one of the world’s largest and most advanced subsea construction vessels. In a second phase of the project, Wärtsilä commissioned an electronic bus link, a newly developed module that allows the ship to share load and energy optimally between the three Wärtsilä energy storage systems. This technology is expected to generate additional operating cost savings, and a total reduction in annual fuel consumption of two million litres. The estimated annual reduction in exhaust emissions is 5.5 million kg of CO2, 30 tons of nitrogen oxides (NOx), and 1200 kg of sulphur oxides (SOx). “This is a forward looking solution that offers both cost and environmental benefits, including less maintenance, reduced fuel consumption, and fewer exhaust emissions. In addition, it promotes more efficient and safer operations for the ship. We are confident that the positive impact of this solution will eventually be felt throughout the industry,” says Sindre Utne, General Manager, Wärtsilä Project Centre, Norway. “The project has been driven by our focus on reducing the environmental impact of offshore oil-related operations in the North Sea. The advanced Wärtsilä energy storage system is important, because of both the favourable fuel consumption as well as its sustainability. 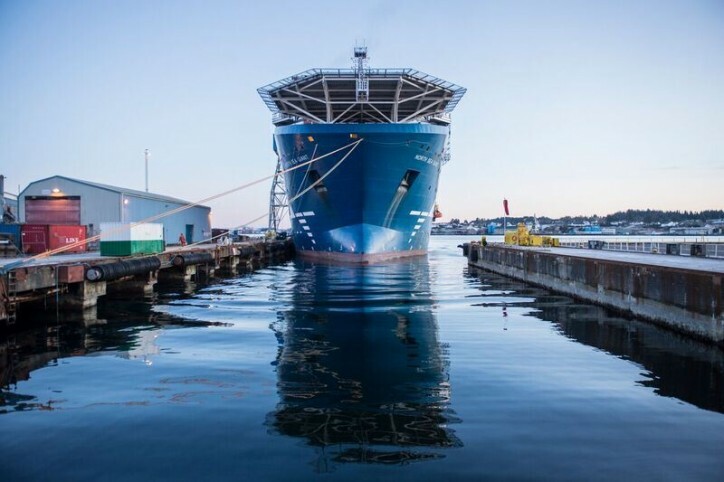 Seabed installations are increasingly moving further north into very sensitive environmental areas, which makes this system extremely relevant,” says Hallvard Klepsvik, CEO of North Sea Shipping AS. The three Wärtsilä energy storage systems reduce load fluctuations on the ship’s diesel generators. Typically, vessels utilising dynamic positioning require two or more engines operating simultaneously at low load to secure back-up power. By using the Wärtsilä hybrid battery system to provide the needed reserve power, the operational engine can be run closer to its optimal load point.